Karen Keninger (M.S. ’92 English) has had an interest in library services for the blind since she was 7 years old. Diagnosed with retinitis pigmentosa, a degenerative eye disease, as a child, Karen embraced the services that allowed her to read and learn through braille, talking books, and other devices. As a high school student, she once received an entire truckload of braille books after sending a letter to her local librarian requesting that she “send me everything you have on Russia” for a social studies report. Karen served as director of the Iowa Library for the Blind and Physically Handicapped from 2000 through 2008, and for the next four years she served as director for the Iowa Department for the Blind in Des Moines, overseeing library, vocational rehabilitation, and independent-living services for the state. 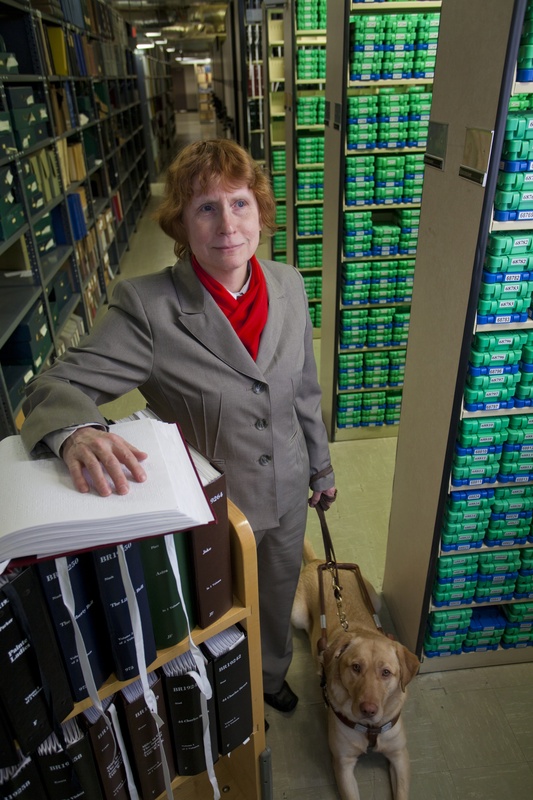 In 2012 she was named director of the National Library Service for the Blind and Physically Handicapped (NLS) in Washington, D.C., a program of the Library of Congress. Moving alone to an apartment in the D.C. metro area was “daunting” after living in a spacious home in rural Newton, Iowa. The NLS provides free services to approximately 500,000 blind, handicapped, and sight-impaired patrons across the United States through about 100 network libraries. In addition to the braille and audio book programs, the NLS has also begun a digital download service for books and magazines. At her office on Taylor Street on the northwest side of Washington, D.C., Karen uses a braille writer (“old fashioned, but still the best way to put braille on paper”); a small, computer-like refreshable braille machine (“expensive, but lovely”); and a digital talking book machine (with large, easy-to-use buttons). On her desk are photos of her six children and 11 grandchildren. By her side is Jimi, the yellow lab/golden retriever service dog she got just before leaving Iowa.